The passive provider chest is a large advanced storage item that is part of the logistic network. 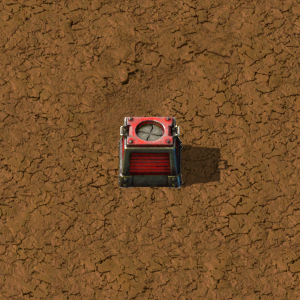 Logistic robots will pick up items from this box to move them to requester chests or the player only. This makes them useful for storing items in a specific location, rather than a centrally located storage chest. If you want the contained items to later be consolidated in storage chests, then use the active provider chest instead. Construction robots will pick up items for construction, replacement of destroyed entities and repair packs from passive provider chests. Passive provider chests have the lowest priority as pick-up points for logistic robots. Logistic robots will not empty passive provider chests if the requested items are available in active provider chests and/or storage chests. This page was last edited on 13 April 2019, at 03:09.